A free-to-play MOBA, Shards of War takes the traditional elements of the MOBA genre and ads their own spin, creating an exciting, action packed game. Stepping away from the classic fantasy themed MOBA Shards of War is a futuristic themed game with a number of twists and tweaks on gameplay to bring shorter match times and more control to the player characters. In the future and unstable portal technology has linked various parallel universes together known as Shards, these vague mirrors of Earth have shown how life could have changed (for better or worse) and now fighters known as Sentinels move between these Shards where some wish to close the portals and restore balance where others wish to try and conquer these new worlds and escape the horrors of their own. From the Lock down Shard where the vast majority of its populous have been locked away in city slums, the Prime Shard which has revealed a high-tech futuristic world with advanced AI and nanotechnology or the Black Some Shard where the dying sun has left its people in a post-apocalyptic world trying to survive. Whilst many of the features of the game are traditional to the genre there are a number of adaptations and enhancements to create a different type of game. Shards of War is true to the classic three lane MOBA map where players must fight past tower defences and enemy waves of drones to reach and destroy the opposition base in a fast-paced 20 minute match. Using the WASD keys players are able to move their character independently of the direction in which they are attacking offering up more control and the ability to use different tactics. Players will be able to try and control the middle lane which will give them access to neutral drones and so offers up a second challenging objective for both teams during a match. As ever teamwork is important in these types of games and this is further enhanced with the introduction of Team Levels where players do not fight simply to advance themselves but their allied teammates as well where any individual successes contribute to the entire teams benefit. 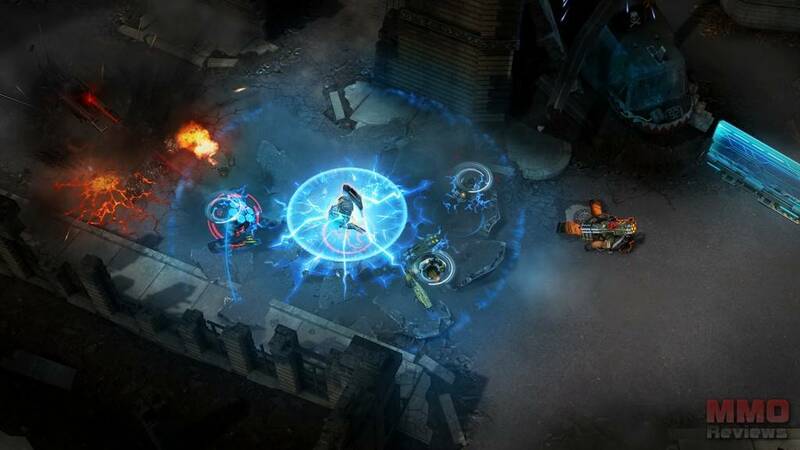 Players can choose initially from 10 unique characters known as Sentinels, though this number will increase that launch and as the game goes on. Each Sentinel has their own unique abilities and skills as well as a classic role that they work best in, whether focusing on destroying towers, farming drones or attacking other characters, a Sentinel will be classed as an Attack, Support or Tank Sentinel. As well as the various available Sentinels that players can choose from, they can further customise them with their own personal Loadouts, items that they have gained access to that go into their own personal gear arsenal. Before each battle players are able to choose which of their items they wish to take into the match, offering up various boosts, tactics and other actions that can help benefits them and their teammates. Players can craft their own items through the material is gained from a war chest each time they complete a match or use these materials to upgrade items they already own into more improved, high-powered versions.